Separate crescent rolls into triangles and place them into a greased 10-inch pie plate with the points toward the center. Press dough onto the bottom, and up the sides of the pan to form a crust, sealing perforations. Spread the mustard over the crust. In a skillet, cook the diced bacon over medium heat until crisp. Remove the bacon from the skillet. Saute zucchini and onions in bacon drippings until tender. In a large bowl, combine eggs, cheese, seasonings, bacon, and zucchini mixture. Pour into crust. Bake at 375 for 25-30 minutes, until a knife inserted in the center comes out clean. This looks delicious! I printed out the recipe to try this week! This looks so yummy! 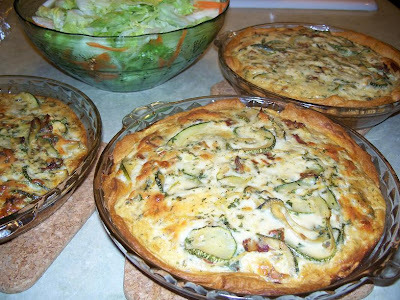 I plan on making as soon as I have some more zuccini ready.